Bill Chu, founder of Canadians for Reconcilation Society, wrangling rides. Photo: Ray Liu, raycatcher.ca. Reprinted with permission from TheTyee.ca. Forty-eight of us are standing on the banks of the Fraser River at the Lytton ferry under a hot September sun. We’ve just been told that the bus we were supposed to take to the other side will – inexplicably – not be allowed to make the short passage. We watch as the grey Fraser churns around the ferry, powering its short journey to the other side. There’s no other access across this swift stretch of the Fraser to the ‘Chinese rock piles’ – the little-known site of shared Chinese and Indigenous history that is our destination. The Lytton ferry takes only 16 passengers and two vehicles at a time, and our tour is on a tight two-day schedule. Crossing on foot and walking the dusty gravel road is not an option. 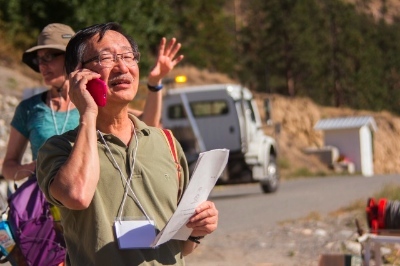 Bill Chu – our tour guide and a retired engineer who immigrated from Hong Kong to Canada in the 1970s – pulls out his cellphone and begins making calls. Within a few minutes, three separate vehicles come bouncing down the road towards the ferry, from opposite sides of the canyon – one driven by a member of the Lytton First Nation. Chu – due in no little part to his organizational alacrity – has found us rides. However, the real credit goes to Chu’s long-established relationships with both Indigenous Nations and others who desire to protect the historic sites along our tour route. However, this year’s excursion has a special twist. In the past, Chu’s tours have drawn large numbers of Chinese Canadians looking for a fuller history of Chinese immigrants in Canada. This year’s trek, however, is specifically targeted toward English-speaking Christians. While not all tour members self-identify as Christian, collectively they represent close to a dozen denominations, from varied ethnicities and nationalities. At least five are ministers, several are teachers, and one group works together tackling social justice issues like urban poverty and social housing. “Something would be amiss if we stop at the TRC,” Chu says, noting that the damage to Canada’s Indigenous populations goes far beyond that of residential schools. “I don’t want people to be under the impression that ‘reconciliation’ has already happened. It’s a process that involves engaging both sides” – something he points out the TRC was not mandated to do, as perpetrators were not included in the process. Christians, he suggests, have a specific mandate within their faith towards restoring the right relationship between people, the earth and the divine – he hopes the tour will be part of calling this group to account. Looking out from abandoned CPR tunnel blasted by Chinese railway workers. Photo: Ray Liu, raycatcher.ca. The first stop on our journey is an abandoned railway tunnel near the Seabird Island Band, a First Nation with Stó:lo and Thompson heritage. 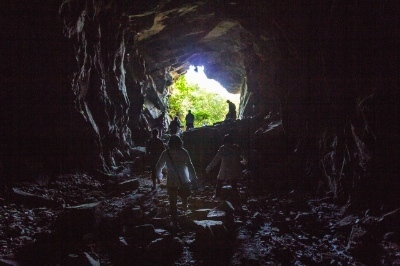 In the late 1800s, this tunnel caved in on Chinese Canadian Pacific Railway workers during railroad construction, and the effort to blast through the mountain was dropped. But long blasting holes in the rocks and decaying bits of supporting timbers remain, silent reminders that the idiom, “not a Chinaman’s chance,” came from this era. Chu recounts how white workers would stand on the side and gamble on how many Chinese workers – paid at half the rate of whites – would return alive from the blasting and other dangerous tasks they were asked to perform. The Seabird Island Band hosts our lunch, during which band member Sarah Ewen speaks to us about her Chinese and Indigenous heritage. Although she knows very little about her great-great grandfather other than his last name, Ewen (perhaps the Chinese surname more commonly rendered Yuen), she knows that he was probably a railway worker. He settled on Seabird Island and died while blasting a tree to clear his land. Both Chinese and Indigenous people were discriminated against by white settler society. Ewen explains how her people were always very welcoming to the Chinese workers. “If someone needed food, we would give them food. If one of our hunters caught a deer, he would share it with everyone,” Ewen says. Sarah Ewen of Seabird Island Nation speaks about her Chinese heritage. Photo: Meg Mittelstedt. Chu recounts stories of how injured railway workers would be left to die along the railway or buried in shallow graves. While on his deathbed, one Vancouver restaurant owner gathered his children together and told them that they must always be respectful to the Aboriginal people. He explained that as a railway worker, he had been left beside the railroad to die. The Indigenous people of the area had picked him up, taken him to their home and nurtured him back to health. Back at the Lytton ferry, the group loads into the rear of an open-bed truck and the other vehicles. We bounce along the gravel road to the Chinese rock piles, where Lytton First Nation member Bill Paul meets us. Bill Paul describes how the Lytton First Nation helped Chinese miners. Photo: Jackie Reiners. Paul, a “west-side” of the river dweller, tells us these hand-stacked rock piles – which stretch for two kilometres along the river – are the results of placer mining operations carried out by Chinese workers. The bed of rocks was created by hand-sorting the largest rocks out of the soil, so that the remaining smaller glacial till could be washed for gold nuggets. Paul throws open a blanket full of artifacts – remains of a gold weighing scale, a grinder, dishes, pickaxes. He has retrieved these items by excavating a site on his land that once housed a Chinese town. 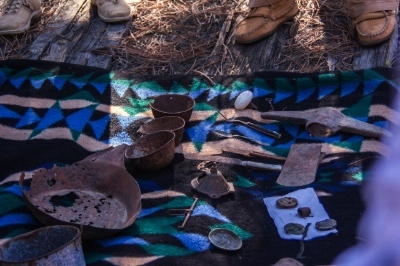 Chinese artifacts collected near Chinese placer mining camp. Photo: Ray Liu, raycatcher.ca. Chu and Paul’s friendship is an example of the Indigenous generosity of which Paul speaks. Chu had heard that there was a Chinese historical site on the west side of the river near Lytton, but became lost while searching for it several years ago. Paul happened by in his truck and led Chu to the site. For the last several years, he has hosted Chu’s historical excursion on his land. Today, Paul’s wife even drove their own car down to the ferry to transport our stranded group. 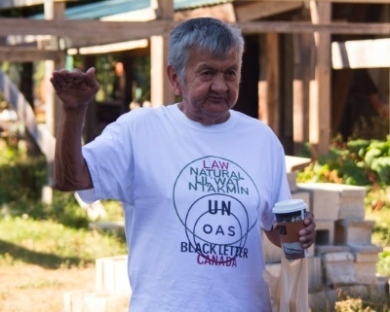 Paul was one of seven plaintiffs in the 2000 residential school trial pertaining to the sexual, physical and emotional abuse they suffered while attending the Anglican-run St. George’s Indian Residential School in Lytton, B.C. I ask him how speaking to this year’s tour is different for him, knowing that it is specifically geared towards English-speaking Christians. Chinese gravesite preserved by the Indigenous nation on whose land it sits. Photo: Meg Mittelstedt. The tour bus continues on to Lillooet, stopping on the way at unmarked Chinese gravesites preserved by Indigenous nations. As we travel, our host Bill Chu tells stories drawn from his many journeys to discover the real history of the Chinese and Indigenous peoples. In 2004, Chu drove up and down the Fraser Canyon inviting Indigenous leaders to a historic banquet in Chinatown to celebrate the shared Chinese and Indigenous history. Although it was early November and already snowing, Indigenous leaders drove the treacherous roads to meet with Chu. These kinds of efforts on both sides are the relational foundation that give the tour access to little-known and restricted sites on Indigenous land. On the bus, Chu plays educational videos that provide a broader background to the history of colonization within Canada. One is a presentation by Tl’ul’thut lawyer Robert Morales on the Doctrine of Discovery – the 15th century papal bull that has been used in numerous court cases to justify the idea that European-background Christians “discovered” an empty land – and were therefore entitled to occupy and possess it. In late September, a group of Catholics nuns and lay people called on the Pope to officially revoke the Doctrine of Discovery as a doctrine of the Catholic Church. Obscure as it may seem to many Canadians today, the Doctrine of Discovery is nonetheless a very present part of the ongoing injustice against Indigenous peoples. The next segment of our two-day tour takes us through Lillooet and on to the Mount Currie reserve, a part of the Lil’wat territory, where we are hosted by Wenemqem (Alvin) Nelson, from the Lil’wat Nation. 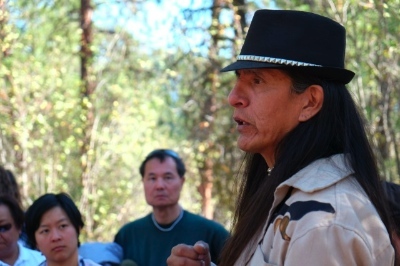 So when the Mount Currie reserve began a July 1990 blockade at Duffy Lake Road to protest clear-cut logging and the destruction of their territory, Chu went up to visit the blockade and learn more. There he met Nelson. Their friendship was the beginning of Chu’s education about Canada’s colonization of Indigenous peoples and, incidentally, about the shared history between Chinese and Indigenous peoples. Pau Tuc la Cim (James) Louie of the Lil’wat Nation. Photo: Ray Liu, raycatcher.ca. Our bus pulls into Nelson’s driveway on the Mount Currie Reserve. We pile out and are escorted to the back field where we stand amongst Nelson’s horses and listen to Pau Tuc la Cim (James) Louie and Roslin Edmonds, both of whom are known for their strong public stands for Lil’wat sovereignty. Louie gets right to the point as to how the Lil’wat people see their territory. “All the other [Indigenous] nations around us all know the corner posts of our territory, and those markers are honoured by all the states and nations around us. It’s very, very simple to be respected and acknowledged,” he says. However, he says that living on a reserve is a “prison camp.” “We are sick and tired of being treated as wards of the state,” Louie adds. Wenemqem (Alvin) Nelson with members of the CFRS tour. Photo: Ray Liu, raycatcher.ca. Louie was one of a delegation of three Lil’wat to go to the UN to present a human rights case regarding the apprehension and foster care placement of six children of a Mount Currie mother, Londi Edmonds, by the B.C. Ministry of Children and Families. In January of this year, the Inter-American Commission on Human Rights, the regional human rights organ of the Organization of American States, admitted the case. As the bus passes through Pemberton and Whistler on its path back to Vancouver, a scene from the morning plays through my mind. 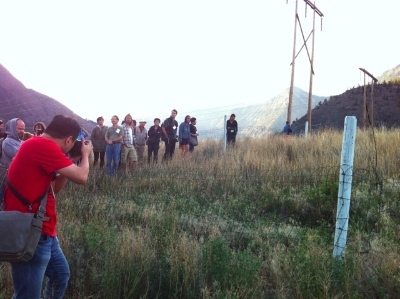 Near the town of Lillooet, on Lil’wat territory, our group stops for a short Sunday morning service on a footbridge over the Fraser River. An osprey nested on the trusses takes flight as we make our way onto the bridge. On either side of us, camped on the cliffs below, members of the Lil’wat Nation maintain fishing sites. We begin with an a cappella hymn in the morning stillness, which is to be followed by a short discussion of the Christian responsibility of reconciliation as it applies to all of creation. As the minister begins to speak, drums begin to echo off the canyon walls around us. First one, then another of the Lil’wat manning the fishing camps begin to sing songs in their own language. The CFRS tour holding a service in Lillooet. Photo: Setsuko Sonoda. The minister attempts to continue, but the drumming and singing command our attention. It’s a moment filled with a strange tension – are these songs oppositional? Complementary? Despite have obtained permission, we are a large group entering Lil’wat fishing territory. We have scared away the osprey and broken the stillness of the morning with Christian song. It would be easy to see the drumming and songs as some sort of statement: a re-establishing of territorial authority. Others group members interpret it as the Lil’wat joining in with the spirit of the moment. Whatever the case, it’s a very fitting metaphor for the tenuous nature of the relationship between Indigenous and settler – and the very open question of whether harmony can actually be established. Meg Mittelstedt is a Vancouver-based journalist with interests in Indigeneity, technology and social justice. Follow her on Twitter @meg_mittelstedt. Such a moving, well-crafted account of significant historical milestones visited on the trip, while at the same time educational for those of us who are ignorant of this shameful yet heroic era of indigenous/Chinese/BC/Canadian history. I would like to learn more about this, as well as the Canadians for Reconciliation Society. Thank you, Bill, for your faithful mission, and thank you Meg, for writing such a meaningful article. May God bless and continue to grow God’s purposes for this. Thanks Meg for this engaging and powerful writing. You captured the essence and emotion of this trip for many of us. I relived the impact of this journey on my life as I read your words and gazed at the pictures.